Whichever way you flip the Zenhaven the logo stays the same! ( Silly, but I love it)! How do you choose a Zenhaven comfort level? You simply flip the mattress over. The Talalay process produces a very consistent latex in a wide range of firmness levels. 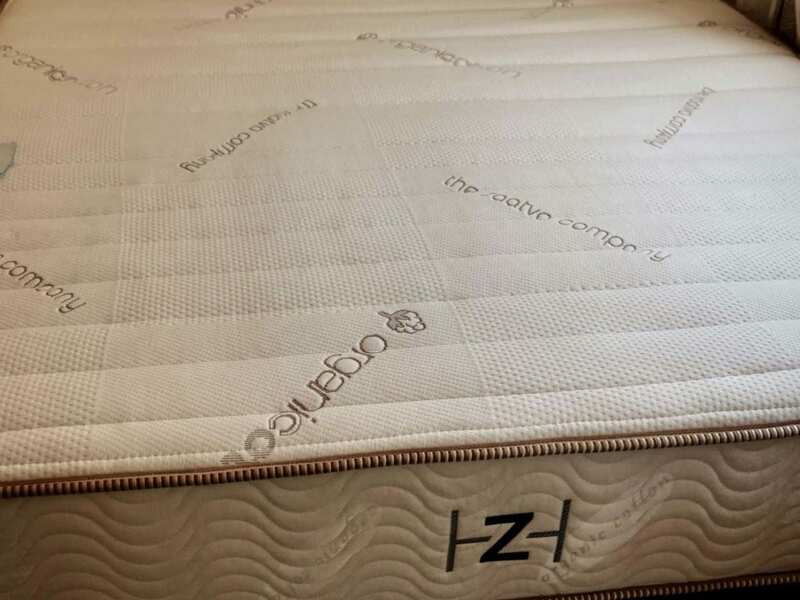 And so our friends at Saatva were able to vreate the Zenhaven matress built with two different comfort levels – that you can actually feel- into a single mattress. 80% of latex customers choose a Luxury Plush comfort . It conforms and supports your body effortlessly while still maintaining an ultra-luxurious, plush feel. Great for if you are a back, side or even stomach sleeper. The Gentle Firm side is 18% firmer than Luxury Plush, for those who want a slightly firmer feel. Gentle Firm still provides uplifting, pressure-free support .The perfect firmness you are looking for if you are a back or stomach sleeper. The Zenhaven Secret: THEIR Proprietary 5-Zone Latex Comfort Layer. By varying the size and distribution of the “pinholes” formed during the Talalay process, a seamless mattress was created formed with 5 distinct zones of density, giving Zenhaven that distinct firmer support beneath the torso and shoulders and more subtle support elsewhere. The result is pressure-free support and better spinal alignment. The fact that you can flip it over for a different level of firmness that you can actually feel and experience! Won’t sleep as cool as other mattresses due to its 100% organic cotton, but a cooling mattress cover might help. Too heavy to flip it by yourself! Get some help. Natural latex is the best-kept secret in sleep, and once you have experienced it, nothing else will do. It instantly responds to every curve of your body for pressure-free support and incomparable comfort on both traditional and adjustable bases. Zenhaven naturally resists mold and microbes. Its durability is outstanding. And no latex brings these benefits together more perfectly than pure American Talalay latex. In my video review you can see how the label looks the same either way you flip the mattress. Now, I know that you must think this is such a small detail that it isn’t worth mentioning. However, this shows how much though they have put into every little detail. 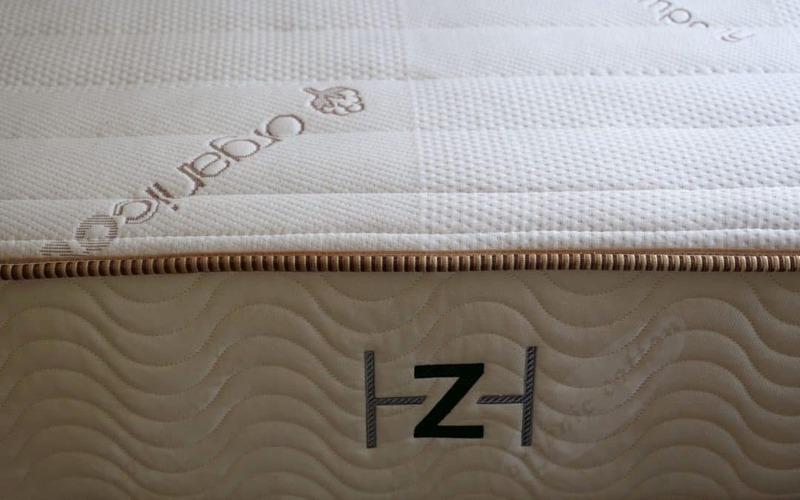 What is Inside the Zenhaven Mattress? Zenhaven Premium Talalay Latex features a 5 Zone design that provides the sleeper firmer support where needed for the ultimate spinal alignment. The Zenhaven Base Layer is made with 100% Pure Talalay Latex for better sleep quality that would be ultimately healthier giving you comfort and support at the same time. Anyone who is considering a top of the line 100% Talalay latex mattress. To get this level of quality you are going to have to pay a good amount for it, but every penny you spend will make you happy. This is clearly one of those pig time purchases that you can feel good about for years. Talalay latex mattresses typically last longer than polyfoam mattresses so expect to get more than 10 years out of this mattress. Zenhaven’s direct to consumer model is a bit different than the typical bed in the box, since it doesn’t ship in a box. Rather, Saatva relies on a White Glove Delivery service. They also manufacture their beds out of nearly 30 different American factories so your mattress was likely made close to where you live. If you were at a mattress store and looking at the $4,000 latex selection, this is the mattress for you. Feel free to put the savings into other bedding or even into a lineal adjustable base.